Yesterday, the Feast of Sts. Peter and Paul on the Roman calendar, I heard a song on the radio by Peter, Paul, and Mary. That's what remined me of the feast. 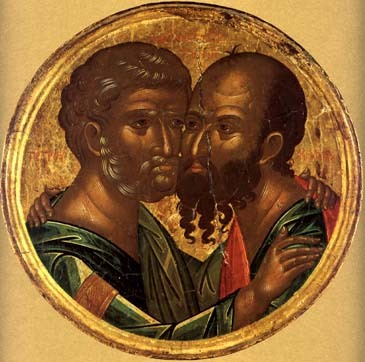 Today is the feast of the "first martyrs of Rome," among whom we may count Saints Peter and Paul, the two greatest apostles. While I like 60s folk music, that little juxtaposition between the secular and the sacred reminded of the vast discrepancy between the true faith and the comfortable paganism most of us prefer. There are many reasons why Europe has become essentially secular, despite its Christian roots, and why American culture is predominantly secular despite the residual religiosity of many Americans. But I'm convinced that the biggest reason is our natural preference for comfort over sacrifice. As a result of scientific and technological advances, most of us in the West enjoy a standard of living inconceivable to our forebears. Fat and sassy, we treat God as just one more lifestyle option, and take for granted a power over life and death once thought to be God's alone. Even old-fashioned paganism is resurgent because it celebrates natural joy within the confines of a given, larger reality that does not require us to die and be reborn. One can experience echoes of such joy in folk music the world over. America's last good folk-genre flowered in the sixties with the likes of Pete Seeger, Joan Baez, and of course Peter, Paul, and Mary. The worldview implicit in such music is spiritually satisfying to many of my generation on the secular Left. But if Christianity is true, it is all a comfortable illusion. Contemporary Westerners, at least for the most part, are quite willing to accommodate something called "man's search for God." Such a search makes people seem "deep," expressing dissatisfaction with the finite and broken without calling forth any particular commitment of heart and soul. But by the same token, people are often unwilling to accommodate actually being found by God. The explanation can be found by contemplating any crucifix. Peter and Paul were, by tradition, crucified upside down, and the larger group of "protomartyrs" were either burned alive as lampposts on Rome's streets or devoured by wild beasts in the Colosseum. Giving our lives for God as the Son of God gave his life for us is not what most people who accommodate, or even celebrate, man's search for God have in mind. Nor is that surprising. The flesh resists the message that what we are is broken, needing to be broken anew so that we may attain eternal life and glory. That is why devout Christians backslide and, even in their best moments, recoil from the problem of undeserved suffering. Life even on God's terms often seems cruel, and cruelly unfair. It is. That's because life is not about comfort and fairness but about becoming what we are recreated to be. May the past sacrifice and the present prayers of the Roman martyrs, whose leaders' bones remain in Rome, strengthen us to recognize and accept that truth in our lives.